I saw this and thought it was neat. Price was a bit high. DOh.. edit to add it's sold now. That's not the actual P75. 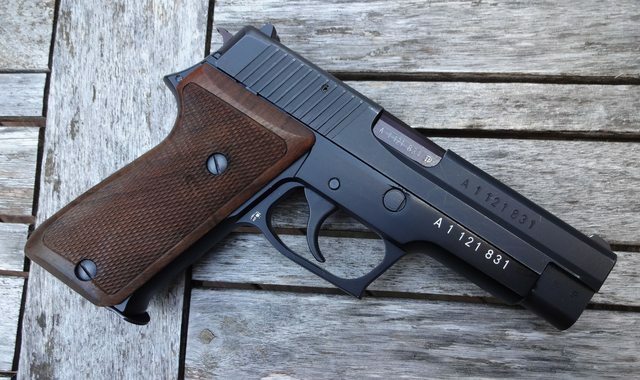 You're right, but i've nerver seen a military P75 without the 45° cuts above the serrations, the only ones i've seen were the "Z"(Zoll) series with tritium nightsights for the border patrol. This is the variant N°5 from 1995, 3100 pcs wwre produced. Variant 4 is with the 45° cuts. So P75s can be imported into the U.S. now if they have the "five year letter"? What exactly is that? I guess the 50 years I was told was a lie. Please let me know if you find some other reasonably priced P75s that can be imported in the future. I thought that Montage Suisse gun was a little high, too, but very close to what I was willing to pay, more like around $800-$850. That's why I thought really hard about bidding since it was only $50 above what I was willing to pay. But that was assuming no one else was going to bid it higher. 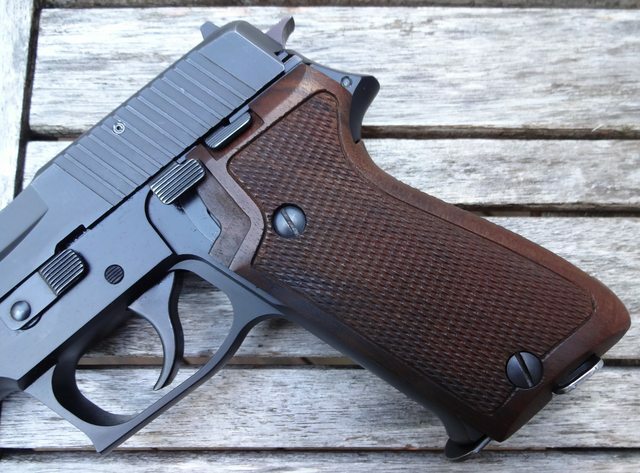 That P220 had been listed a couple of times before with a starting bid of $1,100. I wouldn't necessarily say that you were lied to. A Swiss dealer told me they couldn't be exported to the U.S. due to them being ex-military issue. "Original documentation (such as a warehouse receipt or other document which provides the required history of storage) attesting to where the firearms have been located for the past five years. The firearms must not have been in a proscribed country or area for a five-year period immediately preceding the importation. The information may be obtained from the foreign source from which you purchased the firearms. All documents must be dated within six months of our receipt date." It's not the first time I've seen P75s for sale in the States, so, there's obviously a way. 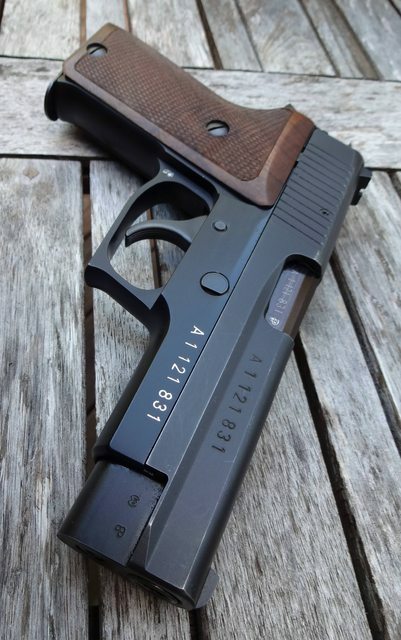 I reached out to the seller when it was listed at $1100 to see what he could do if I bought it along with a P210. He didn't knock off a lot and I moved on when he said he had $1K in it. Always was intertested in getting a P75, but only at about 1/3 to 1/2 the price here. For those who bought them, enjoy. I sure agree, just wish i was one of them. Awesome vid. Ian's always super informative. Thank you too, OTD. I'll post some pics when the P75 gets here. What was the last year of manufacture for the P75? There is no information about it. The Swiss DoD is keeping such info under closure. The last known order was in 1995 for the Swiss border police. 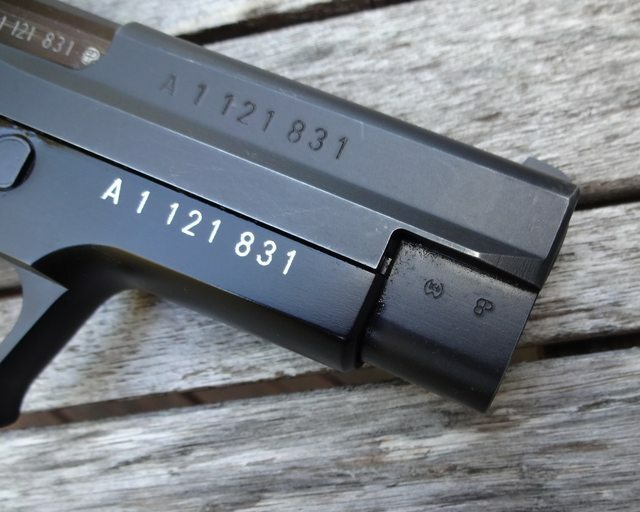 Hämmerli assembled Swiss DoD pistols and based on toto's observation most likely before 1987.This is speculation though. Congratulations and apologies for hijacking your thread. Looking forward to your photos. Oh, no hijack at all. I found your insight into the discussion very informative. She arrived yesterday! Edelweiss did not disappoint. 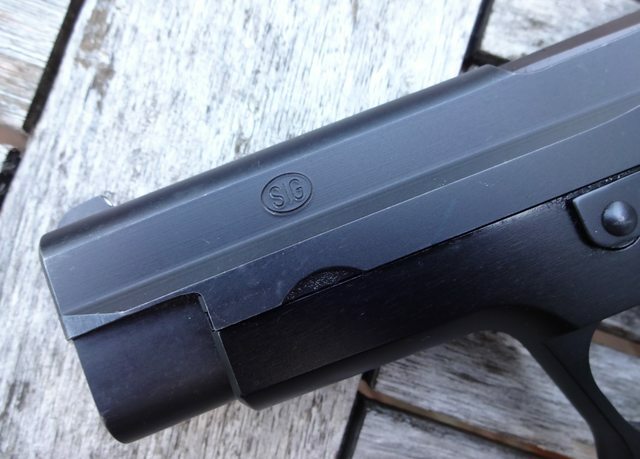 Sig P75 9mm Version 2,in as good condition as one could hope. She looks to have been carried very little and shot even less. I have to say, attention to detail is superb and everything is fit extremely well. The slide to frame fit is super tight, and the action is like glass on glass. 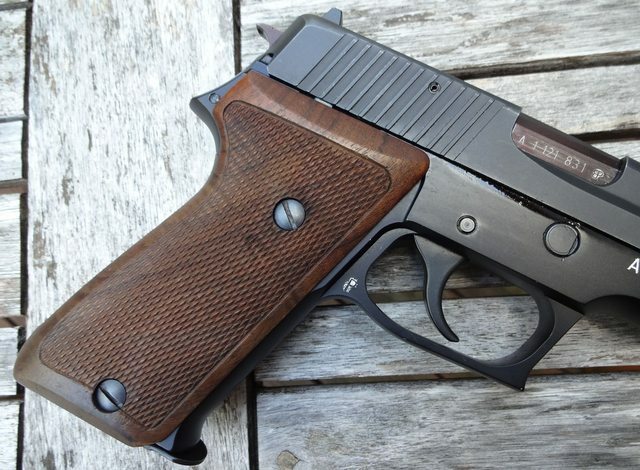 The wood grips are a bit of a deviation from the standard plastic ones(I wonder how many were issued with wood vs. plastic,or is this an aftermarket afterthought?) but I'm really liking them. There is zero corrosion anywhere on the firearm and the bore is 10/10. My only gripe is the DA trigger pull is like 30 lbs! I wonder if I could swap out the mainspring with a reduced power P220 9mm version? ETA: Holy crap were the initial pics big! Had to go back and reduce the sizing. Sorry for the cluster F, guys. Looks great, you did well. Fascinating stuff. I really need to sign up for their mailer just so I can drool. 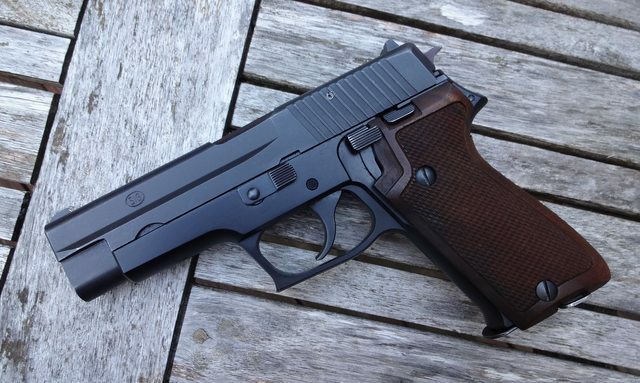 What a fantastic pistol. Birth of a legend. 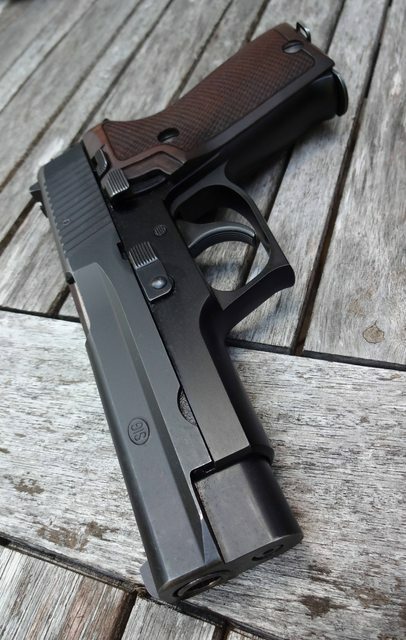 Nice pistol, thanks for the pix. She's a beauty. You done good.